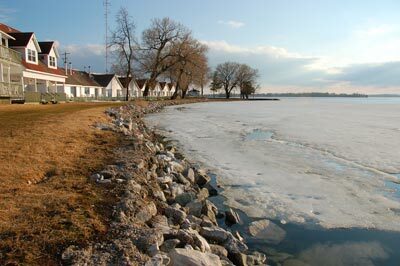 When I was up at Fern Resort at the end of March this year, there was still ice along the shores of Lake Couchiching. Fern has been known as "The home of rolls and honey!" since 1918, when Jim Pettapiece, an Ottawa baker, bought the place site-unseen for $750. Guest rates at the time were about $10 a week. And the fresh rolls were right there in a basket when we sat down in the dining room facing the lake. So I proceeded to dig into the Crerar's Honey and find out what all the fuss was about. True to form, despite my wife's warnings about ruining my appetite, I didn't stop until the basket was empty, my fingers were sticky, and the waitress was smiling at my indulgence, no doubt having witnessed this kind of behaviour more than once. 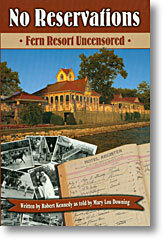 I had heard about Fern Resort before, of course. Anyone who works in the tourism business in Ontario has heard about Fern. But this was the first time I had visited. My partner and I were doing a two-hour presentation to a group of Resorts of Ontario members at their Annual General Meeting the next morning. We've done this kind of thing many times before and it can be intimidating. But resort owners seem to be an extremely friendly bunch, probably because they spend their whole lives attending to the needs of their guests, and they made us feel right at home. The presentation went very well and then after a big lunch (more rolls and honey), Mark Downing showed us around his resort. It's a sprawling series of cozy cottages and larger guest houses hugging the lakeshore, interspersed with a golf course, bocci ball, tennis courts and all the distractions one would imagine at a classic resort. Parts of it have a carnival feel, even during the shoulder seasons when there are less people around. It really says, "This is a place where people come to relax and have a good time." [caption id="attachment_61" align="alignright" caption="No Reservations – Fern Resort Uncensored book cover"] [/caption] Mark pointed out the in-room jacuzzi tubs and hi-speed wi-fi, the modern conference facilities and Bergwen's magnificent ballroom, but he really got my attention when he started talking about the history of Fern Resort. Stories of romantic adventure, intrigue, tragedy, pranksterism, business success and adversity going back over a century is what I like. I like the stories. Mark's extended family is moving into its fifth generation at Fern Resort and some of his guests have been coming every year for almost as long. It's enough to fill a book. In fact, they have filled a book. You can pick up a copy of No Reservations at the check-in counter for about 20 bucks. 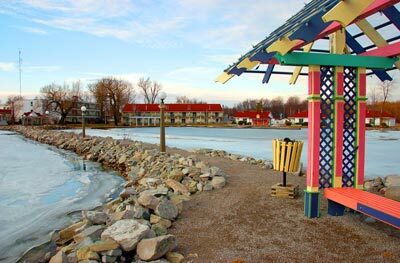 Fern Resort is one of the founding members of Resorts of Ontario, which was established in 1942.